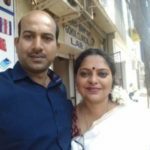 Don’t be afraid of Lord Sanaischara unless you have committed any kind of fraud or crimes, as these are the type of offences that attract the greatest anger of Lord Saturn. As far as possible one should try and visit Thirunallar with one’s entire family (husband, wife, and children) and stay there for at least one day (preferably overnight). There are lodges at Thirunallar to facilitate your stay. If it is not possible to visit the temple personally then pujas can be offered through other persons and prasadam can be obtained from the temple. The best day to offer worship is Saturday. Ideally, you should arrive by Friday evening. One can expect a lot of crowd on Saturdays. On most Saturdays, the devotees exceed 50,000 in number. Be prepared to wait in long queues. 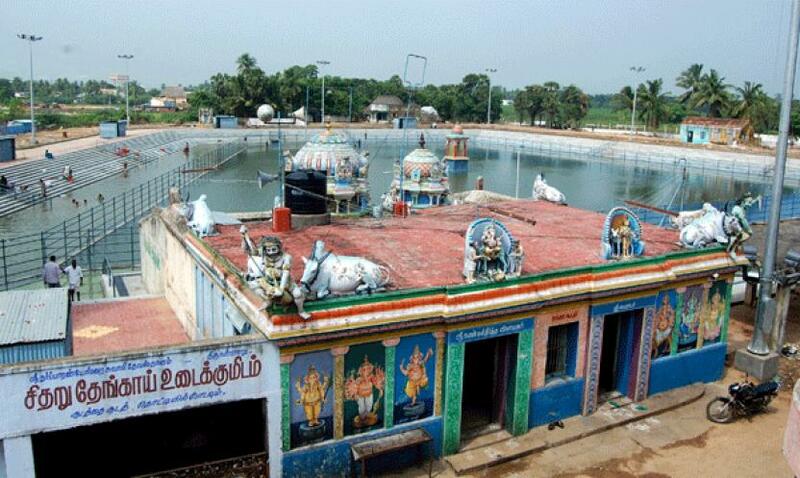 The first step before entering the temple is to take a bath in the temple tank known as Nala Theertam. 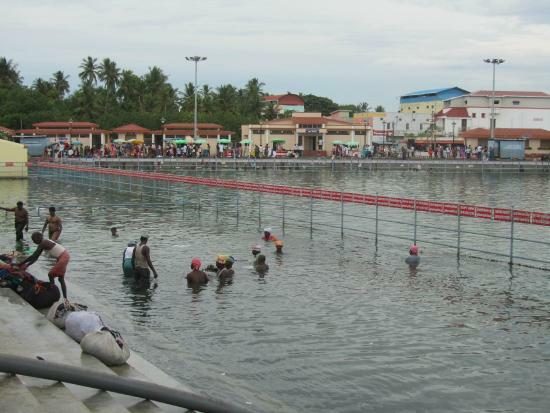 Procedure for taking a bath at Nala Theertha – There are different views regarding this and we are presenting both views. We do not know the best method and advice devotees to choose the option they are comfortable with. Advise A: Pandit Narendra Babu Sharmaji advises devotees to NOT leave behind clothes in the Nala Theertham i.e the temple tank. He says that one should carry the old clothes back in a cover and wear new clothes while visiting the temple. While taking a bath you must completely immerse yourself in the tank water – that is you should be wet from head to toe. Any clothes and ornaments (including jewellery and divine threads etc.) should be left behind on the banks of the pond. Warning: Remove all jewellery and divine threads before entering the tank for a bath. If you do wear anything then it must be left at the Nala theertham. Carrying back items worn during bath will increase malefic effects of Shani and the doshas of others will also attach itself to you. Once you have finished your bath please change to clean or new clothes and make sure head and body are completely dry. Once the bath has been completed don’t look back at the “Nala Theerth”. and do not return there. Step 2: Proceed to visit the Ganesha Temple nearby to 0ffer prayers. 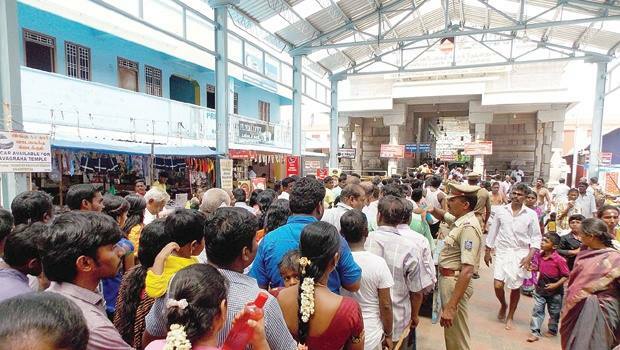 Buy coconut and camphor before entering the Ganesha Temple. 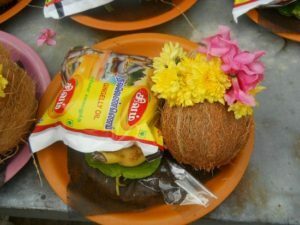 Once you are out of the Ganesha temple, with prayers in your mind break the coconut at the coconut stand. The Ganesha Temple can be seen in the image above. The other items include flowers, Gingerly oil, small black cloth, betel nuts, and bananas. Once you are at the entrance depending on your preference you can either opt for free darshan queue or opt for the paid darshan queue. The lines are usually long but move reasonably fast. The temple authorities are experienced at handling large crowds and this is quite evident in the way they manage to keep the crowds under control and moving fast. Depending on how the queue is managed you may either pass the Saniswara Sannidhi first or you may first pass through the Shivan Sannidhi. At the temple it is advised that one should first have darshan of Lord Sanaischara and only then should they have the darshan of Lord Shiva. If the queue reaches Lord Shiva before reaching Lord Shaniswara then please return to the Shiva Sannidhi before leaving the temple. First, you have the Darsha of Lord Saneeswara followed by Lord Shiva and then of Ambal. Once out of the Sannidhi you can light lamps with gingelly oil and with black til (sesame) or til rice (sesame seed rice) that is offered as nivedhana. Perform Navagraha Shanti Homas ( a puja to satisfy and calm down the anger of the planets). They offer money in the hundi, cows to the temple. Many also shave their heads and offer the hair. One can perform Navagraha Shanti Homas (a puja to satisfy and calm down the anger of the planets) by contacting the Temple administration. You can also offer Abishekam to Lord Saneeswara and Lord Dharbaranyeswara. Milk, rosewater, tender coconuts, oil, curds, sandalwood paste, and vibuthi are offered as part of the Abishegam. Many devotees offer a saree at Ambal Sannidhi. You can also offer Annadanam at the temple. There are facilities for devotees to shave their hair and offer it at the temple. Apart from the big Sannidhis, there are many other smaller Sanidhis in the temple. 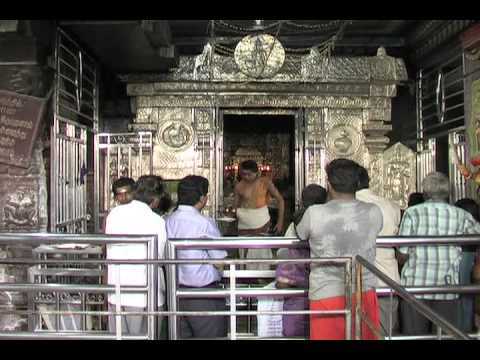 Many people like to visit the Kubera Ganapati Sannidhi as it is considered lucky. Sumangalis like to visit the Goddess Durga Sannidhi. 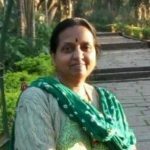 The complete list of smaller Sannidhis has listed above in this post. After visiting Sanaischara Temple, it is advised that one should return home directly and not visit any other temple on the route.